“Hans Adolf Krebs received the Nobel Prize in Physiology for his “discovery of the citric acid cycle.” He was knighted in 1958.”–Via Wikipedia. Now you can put a face to the architect of your biochemical nightmares during this week. Just when you think you’re out of the woods after Glycolysis–you say to yourself: “I can take a breather”–the Krebs Cycle (a.k.a. The Citric Acid Cycle, or the oxidation of citrate) makes its appearance. It can be just as complex, if not more, than Glycolysis. But the main thing that we have to take into account about this catabolic pathway–and catabolism of carbohydrates is all about accounting–is the redox reactions mediated by the enzymes of this pathway. This short animation should give us a brief review of how oxidation and reduction (redox) occur. The following animation–embedded here via Khan Academy–shows a very good summary of the Citric Acid Cycle (notice the importance that the lecturer gives to “the big picture”, which in the Krebs Cycle means the enzyme regulated oxidation of a carbohydrate). This entry was tagged Chapter 7.2: Aerobic Respiration, Chapter 7: Cellular Respiration, Chapter 9: Glycolysis. Bookmark the permalink. ← Glycolysis, or how cells break down carbohydrates. 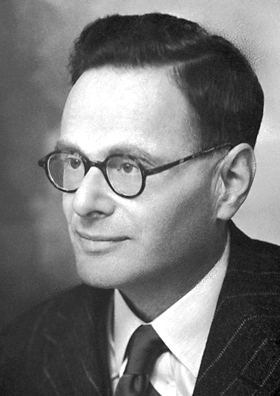 By reading some background information about Hans Adolf Krebs and reading about some of his experiments we can conclude that In an elegant series of experiments, Krebs worked out the cyclic nature of the reactions. He noted that only certain organic acids were readily oxidized by muscle, and found that the oxidation of endogenous carbohydrate or pyruvate could be stimulated by a number of specific acids, all of which turned out to be substrates of the tricarboxylic acid cycle enzymes. Since malonate, which competitively inhibits succinate dehydrogenase, completely stopped the oxidation of pyruvate by the addition of organic acids, he concluded that the succinate to fumarate reaction must be a critical link in a chain of reactions involving all of the known catalytically active acids that can stimulated oxidation of pyruvates. Basically, the Krebs Cycle is a series of chemical reactions used by all aerobic organisms to generate energy in the form of ATP. Living cells use the energy from ATP to synthesize proteins from amino acids and to replicate DNA. The Citric Acid Cycle, or Krebs cycle, refers to a complex series of chemical reactions in all cells that utilize oxygen as part of their respiration process. This includes those cells of creatures from the higher animal kingdom, such as humans. The Krebs cycle produces carbon dioxide and a compound rich in energy, Adenosine triphosphate (ATP). This chemical provides cells with the energy required for the synthesis of proteins from amino acids and the replication of deoxyribonucleic acid (DNA). This cycle was first recognized in 1937 by the man for whom it is named, German biochemist Hans Adolph Krebs. His highly detailed and extensive research in the field of cellular metabolism and other scientific endeavors gleaned him the Nobel Prize for Physiology or Medicine in 1953. In conclusion, the Krebs cycle constitutes the discovery of the major source of energy in all living organisms. I found this video very helpful for understanding the TCA or Krebs Cycle. Adolf Krebs made the discovery of the Krebs Cycle, but his discovery was just as important as the discovery that Fritz Albert Lipman made with the coenzyme A and its importance to metabolism. That is why they both shared the Nobel Prize for Physiology in 1953. Both discoveries were very important for the understanding of cellular respiration. The Krebs Cycle generates energy which in turn is used by the living cells to synthesize proteins from amino acids. If we are making breakthroughs in fields such as biotechnology and genetic engineering, a lot of that success has to do with these types of discoveries of the last century. This video helped me understand the Krebs Cycle better. I still have a bit of problems remembering every reaction that takes place, but it helped me learn almost everything I needed to know about it. Thank you for all these posts that help me understand everything so much better. Also, Happy Holidays! The Krebs Cycle is usually shown as beginning with pyruvate instead of acetyl CoA. Pyruvate is a three carbon molecule that is primarily formed by glycolysis or from some amino acids. Pyruvate is converted to acetyl CoA in the mitochondrion and so serves as a direct connection to the Krebs Cycle. This reaction is not really part of the Krebs Cycle, however, since pyruvate is most often generated by glycolysis and the oxidation of pyruvate occurs in the mitochondrion, it is usually associated with the cycle. As said in class this part of the cellular respiration can be confused with being part of glycolisis or krebs cycle! Indeed. CoA is like a ferry that carries the product of Glycolysis (pyruvates) to the Citric Acid Cycle. What impressed me most about this blog was the amazing and extensive work of Hans Adolf Krebs for his discovery of the Citric Cycle or how it was later called, the Krebs Cycle. He discovered a process in nature which is necessary for all living thinks and is one of the two main parts of photosynthesis along with light reactions. All this discoveries led to his Noble Prize along with Fritz Albert Lipmann in 1953.